It all started when I saw the ‘January Block’ by @ladyharvatine on IG. She created it for the LAMQG for their BOM, but the block pattern is available from her shop for the princely sum of $4. And kept going until I had 4 blocks in total, which was just the right size for a mini at 24″ square. When it came to quilting it, I just couldn’t bring myself to go down the straight line or matchstick route, those circles were calling out to me to be highlighted in some way, so I dusted off my rusty FMQ skills (18 months between projects isn’t too long, right?! ), and made myself a couple of paper template that allowed me to mark out the edges of where the circle would have been in the ‘missing link’ sections. I had decided to do a diamond grid in the rings, with FMQ in the centres, but I started with the FMQ in case it all went a bit pear shaped, and needed to grid the whole thing! Luckily my lovely friend Rachael at Imagine Gnats had made a few projects for Paint fabric designer Carrie Bloomston for Market, and had sent me her ‘scraps’, which were really quite large bits – enough to use the paint chips for the back, and the fab red with newspaper strips for the binding. It was definitely a fun project, I now feel a bit of an urge to make more minis or something! You will have one very happy swap partner. It is truly stunning. And the FMQ amazing. I've also bought the pattern just haven't had the courage to tackle it. But I've an open sewing session at our local quilt trainer next week so maybe I will give it a go. Oh this turned out great! What beautiful quilting! I purchased the block pattern and love it, but haven't gotten up the courage yet. Awesome quilting on a fab mini – hope it's loved at its new home! This is so beautiful, Katy. 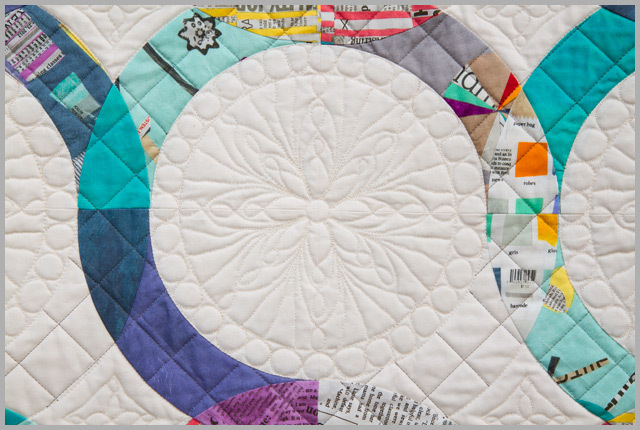 Well done on persisting with the quilting because it really elevates an already lovely block to something extraordinary. You have a very lucky swap partner! I love this mini! The quilting is beautiful! But I love the graphic pop of the pattern! LOVE the fabric choices! They flow together beautifully and pull off the rainbow palette without it jumping out at you. 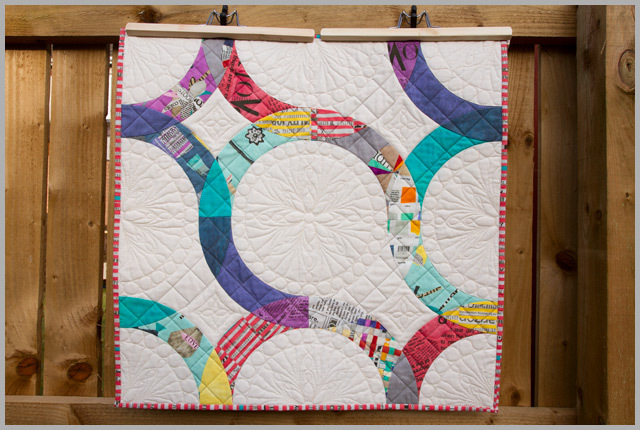 I would have never guessed that it had been so long since you had done free motion quilting- the result looks great. It's beautiful and your FMQ-ing is stunning!! It's so gorgeous Katy ! I love everything about it- the pattern fabric and the quilting. Wonderful quilting Katy, your swap partner will be thrilled with this! absolutely fan dabby dooozy brilliant Katy. Your quilting is spectacular. I'm just finishing the binding on mine tonight, then will post on Monday. and i have to say, that binding just makes my day 🙂 What a lovely mini! Lucky Edinburghian!! 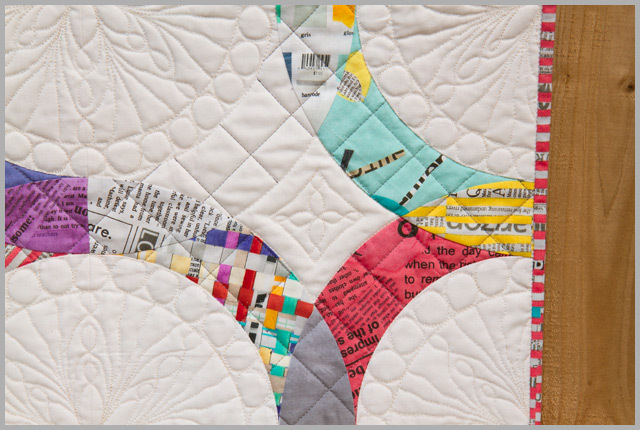 I love this and the quilting is amazing! I bought the pattern after seeing it on IG too! I haven't made it yet…but you have inspired me! It turned out really well. I liked it since your first in progress photo. Well done! What a fun quilt, It's fabulous! Circles/pebbles are HARD I don't care what anyone else says. I am slightly gutted that this isn't mine (OK really gutted) because the quilting is fabulous, I can't believe it's been 18 months!!! Wow! this is so fantastic! You really did a tremendous job with this one.